The very first television ad featuring never-before-seen scenes from the upcoming live-action adaptation of the Disney classic, Aladdin, has been released. The film retells the story of Aladdin and his adventures with the Genie along with familiar songs from the original animated feature by Alan Menken and Oscar®-winning lyricists Howard Ashman and Tim Rice. This new adaptation of the film is directed by Guy Ritchie, written by John August and Ritchie based on Disney’s Aladdin. 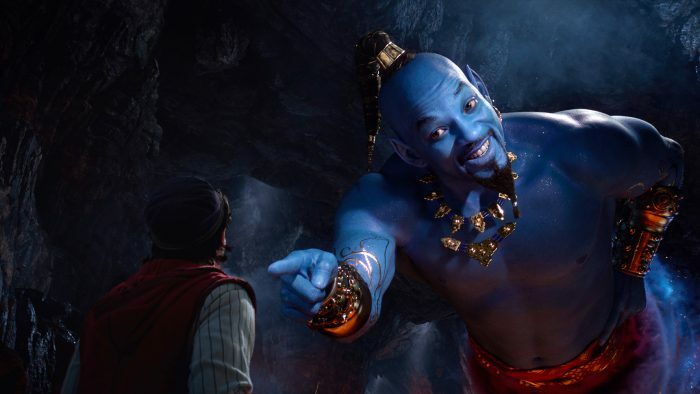 The film stars Will Smith as the Genie; Mena Massoud as Aladdin; Naomi Scott as Jasmine; Marwan Kenzari as Jafar; Navid Negahban as the Sultan; Nasim Pedrad as Dalia; Billy Magnussen as Prince Anders; and Numan Acar as Hakim. Menken scored the new film and also wrote two new songs with Oscar and Tony Award®-winning songwriters Benj Pasek and Justin Paul. Aladdin will be released nationwide on May 24, 2019. Will you be seeing this new film when it is released? What do you think of Will Smith taking Robin Williams role as the Genie? Let us know in the comments below!